Honeywell Sensing and Control has developed sensor technology for use in brushless DC (BLDC) motors which it says will remove the need for chopper stabilisation resulting. The benefit of this is an improved response time, accuracy and reduced electrical noise without the need for additional filtering. “Initially designers may be cautious of using a sensor that does not have chopper stabilisation, but not only does the new technology overcome chopper stabilisation drawbacks, it also brings additional performance advantages of faster response time, repeatability, improved jitter performance and no additional electric noise generation over a range of temperatures,” said the company. Honeywell tested the new non-choppper-stablised sensors against a number of ‘traditional’ chopper-stabilised products – including those with claimed higher sensitivity. The test involved mounting and centering samples as close to each other as possible so that they all experienced the same environment on a circular target with 48 magnetic pole pairs used to trigger the product samples. All results were measured against a Top Dead Center (TDC) trigger that had a very fast response time. Testing also showed that even if the repeatedly issues could be overcome, the chopper-stablised sensors still showed a slower response time resulting in lower efficiency. BLDC motors are growing in popularity due to their higher energy efficiency using electronic commutation versus mechanical commutation to control power distribution to the motor. 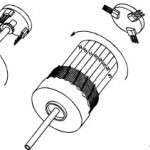 But traditionally most BLDC motor designers turn to chopper stabilisation to mitigate for sensitivity and stabilisation issues without thinking about the new advances that are available. Designers want the best – and with new technology there is now a more effective and cost effective solution available without the ‘traditional’ manufacturing drawbacks.